Undergraduate education and training in the Faculty of Health Sciences at the University of Cape Town has become socially responsive. A story of transformation that is consonant with wider societal developments since the 1994 democratic elections, outlining the changes in undergraduate curricula across the Faculty, is presented. The story of education since the first democratic elections in 1994 is significant in the context of the changes in the country as a whole. The Faculty of Health Sciences (FHS) has made significant progress in achieving equity of access for students. Remaining challenges include recruiting students from rural areas and achieving gender equality in the allied and rehabilitation professions. The FHS has developed innovative approaches to addressing the diversity of educational preparedness to maintain exit-level clinical competency standards. The comprehensive concept of curriculum has become the Faculty vehicle for placing patients'/clients' health issues and students' learning needs at the centre of restructuring. A diverse student body and evolving clinical training platform has created opportunities for new and different dialogues between teachers, students and patients/clients through reflective practice and assessment. The curriculum design principles of inclusiveness, participation and social responsiveness mirror the primary healthcare (PHC) approach. Furthermore, a client/patient-centred approach that strengthens inclusivity and participation has been given impetus with the integration of two of the indigenous languages, most frequently spoken in the Western Cape, and cultural competences into all curricula. Increasing numbers of staff recognise the need to enhance their professional development in educational practice and to acknowledge the implications of the PHC philosophy in their teaching. Developments in undergraduate curricula have significantly realised the intentions of the 1994 FHS's Assembly to promote a continuous process of reflection and action to align curricula with social responsiveness and changes in the national health and higher education policies. In 1994 the Faculty chose participation, inclusivity and social justice, which exemplify the PHC approach, as the lead theme to move away from the past injustices and exclusivity in health sciences education. PHC means health for all as a fundamental human right - not health for some who are fortunate to have access to care, and second-rate care for the rest. In addition to healthcare for those who fall ill or are disabled and present to health practitioners, it also means prevention and health promotion for the population at risk. The Faculty required redefining the types of graduates from all educational programmes, who would be responsive to the health needs of the country. The teaching of isiXhosa and Afrikaans was formalised by 2003. It resulted from a pioneering partnership between the Faculties of Humanities and Health Sciences and is consistent with the University of Cape Town (UCT) policy of preparing students to participate fully in a multilingual and multicultural society. It addresses inequity in delivering comprehensive care to South Africans and is thus aligned with Faculty goals to promote quality and equity in healthcare, and to graduate health practitioners capable of addressing the population health needs. The curriculum, comprehensively defined,1 became the primary vehicle through which educational changes were introduced to develop new graduate competences. Following the South African Qualifications Authority's2 broad conception of curriculum, undergraduate programmes were reviewed in terms of: aims and objectives as they relate to a transforming higher education sector and transforming health sector; selecting what is taught; how that content (knowledge, skills, values) is organised into subjects and programmes; strategies of teaching and learning and relationships between teachers and learners; forms of assessment and evaluation; resourcing the curriculum as to take into account the organisation of learners, time, space, materials; and how the curriculum reflects the needs and interests of students, teachers, community, nation, employers and the economy. Diversifying the learning and clinical training platform has been central to equipping graduates with competences needed for contextually relevant and PHC-orientated services. It includes more primary-level exposure, community-based learning experiences and intersectoral practice placements. This has been achieved through developing teaching and learning facilities at community health centres and communities in the Cape Town Metro area, and a rural clinical teaching site at Vredenburg in the Saldanha Bay subdistrict. The belief is that in a changing health system with evolving healthcare practices, students must develop reasoning and problem-solving skills that are relevant to practice in South Africa (SA). Content in all programmes has also been reorganised to include the following outcomes: promoting equity and human rights in healthcare; displaying biopsychosocial and cultural competence; practising health promotion to individuals and the public; promoting evidence-based healthcare; affirming the social inclusion of people with disabilities; treating patients at the appropriate level of care; promoting multi-professional healthcare; promoting broad intersectoral collaboration; and encouraging communities to assert their rights. This has led to a very productive partnership between the Faculty of Humanities and the Faculty of Health Sciences in the development of language learning for undergraduate students in health. Community participation. Community-based placements develop awareness of the importance of community participation as a health right, the importance of advocacy and enablement of people to assert their rights. Evidence-led approaches to patient, service-user and client-care require a biopsychosocial approach8 which requires integration across relevant disciplines, including the psychosocial sciences, rather than the traditional separation between basic sciences and clinical disciplines and theory preceding practice. Classroom, field-based and laboratory-based teaching and learning methods engage students in active learning, hence widespread adoption of PBL and case-based learning (CBL) in all programmes. Skilled facilitators who encourage student participation, teamwork and higher order thinking are core to both approaches. Built on the assumption that learning is an ongoing, open-ended process, knowledge is integrated throughout the curriculum in a 'spiral of learning'. The selected methods enable students to integrate their experiential knowledge and learning between and across cases over their years of study with real-life problems. The latter serve as a stimulus for learning9,10 as students engage with contextual and biomedical factors influencing health. Students develop appropriate problem-solving skills, experience basic and clinical science learning as more effective and memorable, and learn to apply knowledge to the assessment and care of patients.11 Students are prepared for lifelong learning, following graduation, by developing skills in locating, selecting, interpreting and translating information. In all programmes, tutorials, practicals and lectures, and video material and field visits for contextualised learning, support PBL and CBL. Students are guided into the facets of these methods including: being encouraged to take responsibility for own learning; learn collaboratively; integrate experience, previous knowledge, skills and activities with new knowledge and across disciplines; apply learning back to the problem for deeper understanding; analyse and evaluate their learning and become problem solvers in clinically related and contextually applicable scenarios. As students become confident and competent in these facets, guidance by facilitators is gradually withdrawn. In addition, within a framework of the PHC approach, students are required to consider issues of social justice, equity and human rights in evaluating and managing the health needs of patients and service users. The biomedical domain is transcended with structured learning opportunities that consider environmental, psychosocial, economic, political and cultural factors that affect health. Although both methods are campus-based, the skills transfer is enabled through authentic community-based learning in the early phases of each curriculum. In some settings, learning and service are mutually reinforcing, e.g. Vanguard/Vredenburg, and provide students in all the professions with opportunities to learn through providing services in multi-professional teams and in partnership with communities. Clinical skills laboratories and in-service training opportunities have been expanded to many health delivery sites to strengthen, and reinforce, acquisition of clinical and rehabilitative procedural skills. Changes in assessment philosophy, approaches and methods have been central to curriculum restructuring in all undergraduate programmes. Curriculum task teams engage in a continual process of design of optimum assessment methods to ensure alignment with new learning and teaching methods12 to ensure that students' learning behaviours are consonant with the desired outcomes. High-fidelity assessments of clinical competence in the workplace, the highest level of Miller's13 pyramid, which are resource-intensive (of examiners, patients, physical space, time) and difficult to implement in less well-resourced settings, are a further challenge. 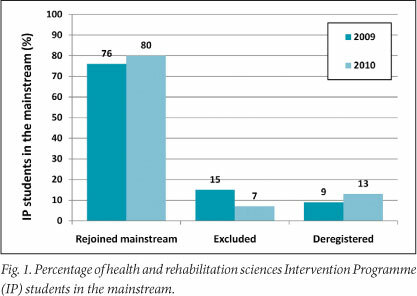 The health and rehabilitation (allied) professions have developed methods that align with their curricula which have become more policy-centred and socially responsive. They have adopted the objectives of PHC-orientated practice and are epistemologically informed by policy and practice frameworks such as the United Nations Standard Rules for the Equalisation of Opportunities for People with Disabilities and the World Health Organization's International Classification of Health, Functioning and Disability (see Lorenzo and Cramm, in this Centenary edition). Assessments reflect the continuum of health and functioning from impairments to activity limitations and participation restrictions within a social context. Examples of such assessments are case studies, portfolios, and reflective journalling that enable evaluation of students' ability to deal with the particular (case-based intervention) and the systemic (how context influences health). Following the above theme of integrated learning, online assessments that include creative use of multiple choice questions (MCQs; best-option, extended matching items) have been introduced to increase the reliability and validity of testing students' capability to integrate basic science knowledge into clinical reasoning. The Centre for Higher Education Development's postgraduate programme in Higher Education Studies provides modules and/or qualifications in teaching, learning and assessment. It is now also possible, as of the last few years, for health science teachers to attend short courses for CPD points and attain postgraduate qualifications in health sciences education - a new sub-specialisation in SA, although well established internationally. Health sciences education research and publications from within the Faculty are also increasing. Tables 1 and 2 show the progress in addressing racial imbalances in students' access to our educational programmes: over a 7-year period the medical programme approximates the national demographic picture while the recent adoption of IP courses by the health and rehabilitation sciences should improve their student demographics. Several features are innovative in addressing access and equity in admissions. Students are not preselected into the IP on the basis of alternative admissions scores as done elsewhere at UCT and in the country. Assessment of students' cognitive, conceptual, language and emotional readiness for university-level study is based on performance in authentic first-year-level courses. It is an extended curriculum that requires regular interaction between IP and first-year teaching staff on all educational issues, thereby enhancing each others' educational practice. Furthermore, monitoring and review of students' performance and educational practices generates findings which continue the process of improving educational design in subsequent years. While it may be premature to compare health and rehabilitation IP students' throughput with that of the previous years in mainstream, 76% of the first cohort of IP students successfully rejoined the standard curriculum and are all now in their second year (Fig. 1). In the second cohort, 80% have reregistered in the mainstream (9% of the first cohort and 13% of the second cohort left to start another degree soon after entering the programme). This should positively impact on the graduation rate in the alliedprogrammes. The curricular changes aim to develop graduates who are competent to practise in diverse settings, including under-resourced and rural areas, hence our extending the clinical training platform. We seek to produce graduates who are able to engage reflexively and critically as socially responsive health practitioners within the South African health delivery system, to promote 'health for all'. The challenge remains to set standards for exit-level competences that reflect our graduates' comprehensive approach to patient/client management in SA. Planned impact and graduate tracking studies will provide valuable data to enable continuing refinement of our curricula.